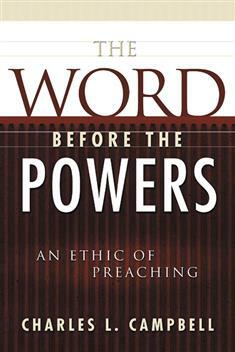 In this examination of the ethical significance of preaching, Charles Campbell provides both fresh insights into the relationship between preaching and ethics and a challenging moral vision for the contemporary church. Moving beyond a narrow focus on moral decision-making or social-issues sermons, Campbell argues that a particular ethic--nonviolent resistance--is inherent in the practice of preaching and shapes the moral life of the church. In the face of the powers, the fundamental ethical task of preaching involves building up the church as a community of resistance. Employing three dimensions of character ethics--vision, practices, and virtues--Campbell demonstrates the concrete ways in which preachers may undertake this task.